Getting married on the beach is such a wonderful idea!A seaside ceremony is super-romantic and one that you and your guests will remember for a lifetime! Once you’ve decided to get married by the shoreline, however, you have to start planning the details. Will it be an elaborate, formal ceremony with lots of friends and relatives or do you want a low-key ceremony with just those who are closest to you in attendance? 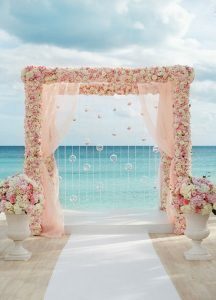 For many couples, the whole idea of getting married on the beach is that they just want to have a simple beach wedding. That being said, we’ve put together some ideas to help you start planning. Airy and light is the theme of a beach wedding! For women, cocktail dresses or tea-length dress work well and Lightweight linen suits for me. 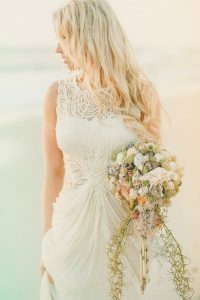 Because of the popularity of beach weddings, many bridal shops also carry simple, but beautiful bridal gowns that are made for just the seashore. Want something more casual? Try tan or beige Bermuda shorts paired with a white polo shirt for the men and a short white dress for the ladies. Of course, the simplest and easiest way to go is to wear a white bikini with a sarong, while the groom wears white board shorts! You can complete any of these fabulous looks with simple beaded sandals or flats. A humble beach wedding doesn’t really even require decorations because our mother earth has already done the work for you! However, you can arrange tiki-style torches on either side of the minister and wrap them with tropical flowers. Also try strewing flower petals on the sand in the shape of a heart? 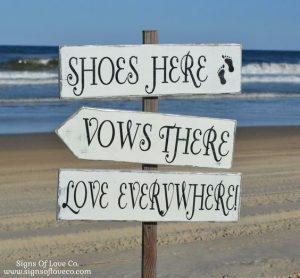 Mark out a bridal walkway (aisle) in the sand with tropical flowers, large starfish stuck into the sand, or large conch shells. Or, a potted palm tree would look great on either side of the wedding couple. 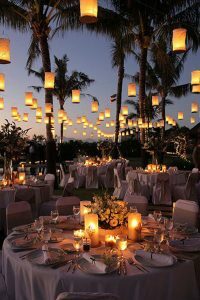 For a beach side reception, use battery-powered twinkle-lights wrapped around raffia of beach colors or put silk tropical flowers on the center of each table. 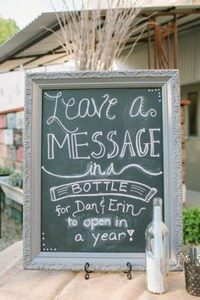 Whether you are having your ceremony, reception, or both on the beach, there are so many cute ideas out there. The beach provides a beautiful scenery, which allows for simpler decor. There are several cheap or DIY ideas for decorating a beach wedding. Below are 8 ideas that will spruce up any beach wedding, and will make you say wow! Something as simple as a ladder can go a long way, when going for that laid back, shabby chic look. Paint a wooden ladder, or leave as is. You can decorate a ladder with flowers, or mason jars, or you can use the ladder as a drink stand. Guests will appreciate iced tea, water, lemonade while waiting for the ceremony to start. Instead of real candles, you can opt for LED candles, since they will not blow or out or present any sort of hazard. Adorn your aisle with a few lanterns on each side, and some flowers to add some charm. They are simple, and adorable. You can purchase these, or make it into a DIY project. String these up along the aisle, or around your arch. Seashells can also be used along with your flower bouquet creating an amazing look and adding on to your theme wedding. You can have various sizes and adorn with flowers. Fill little bottles with sand and a cute little note with the couple’s names. You can use these to decorate or to hand out as wedding favors. Whether it be your initials or some beachy words, spell it out in seashells. There are plenty of cute ideas and designs available for a DIY project. You can line them along the aisle, or just have two near your wedding arch. You can make these yourself, and paint little cute sayings on them. For a simple beach wedding, try just carrying a small bouquet made of a few tropical flowers or orchids. These flowers can be real or made of silk. You can make your own simple, but elegant, bouquet by gathering flowers into a bunch and wrapping tulle or silk ribbon around the whole cluster of stems. Pin the tulle or ribbon to the top and base of the bouquet with pretty straight pins tucked up into the stems. If you really want a humble beach wedding, you’ll have to slim the guest list way down! Close family and friends should be the only people who get invitations if you are trying to keep everything low-key. Don’t invite people out of guilt! You can always have a post-wedding party in a month or two for those who weren’t included in the wedding. 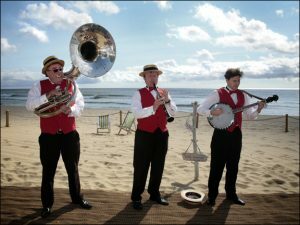 Play wedding music from CD’s on a battery powered player or hire a flutist, saxophone player, or violinist to play for your ceremony. Live music at the reception is always a great idea. Brighten up the romantic mood with some of your favorite music tracks of all time! Choose a creative beach-themed wedding cake embellished with lovely and cute decorations such as beach chairs, edible shells, corals, sand & starfishes. If you want to keep it very simple, forget the seashells and anchors and instead just stick to subtle touches of ocean blue throughout your beach wedding. Welcome bags for a beach wedding are superb. 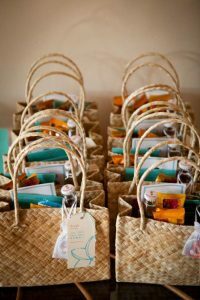 Simple add beach-worthy items to your Welcome Bags such as, flip-flops, sunscreen and sunglasses. Also you can give cute memorable gifts to your guests in these welcome bags which can be used for amazing wedding pictures as well. 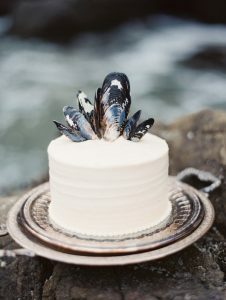 Whether its gorgeous table settings or beach wedding photo ideas, a sand wedding allows for your imagination to go wild, from colors to cakes! Hope these ideas will inspire you to have a fabulous beach wedding.